Taylor Swift sings "You Belong With Me." Marta, Yolanda, and I have chemistry class together. George Clooney and Brad Pitt star in "Ocean's 11." We have a ladder. → Manuel has a ladder. In order for the subject and verb to agree, we needed to change the verb "have" into "has." This is conjugation. Poor verb conjugation was just one of the XFL's many problems. If you've grown up speaking English you can conjugate verbs without even thinking about it; it just comes naturally. Conjugating verbs in Spanish, however, will not come easily. Youll need to stop and think every time, and practice, practice, practice until it becomes second nature. Unlike English infinitives, Spanish infinitives are only one word, but theyre still pretty easy to spot. Note: "-ar" verbs are the most common, followed by "-er" and "-ir" verbs. There are specific lessons for each and every tense on this website, but for the time being well work with the present tense. So we'll need to use yo (I) as our subject. Failing to conjugate verbs correctly sounds just as bad in Spanish as it does in English. If you say "I has a ladder" in English, people will look at your funny. Same thing if you say "Nosotros viven" in Spanish. But remember that were putting the the Ud. in the él / ella box just to simplify things, not because it means he or she. Likewise, remember that Uds. doesn't mean they. Its just in the ellos / ellas box because the verb endings are the same. Make sure you understand this grid. It's very important; you'll be seeing a lot of it as you study Spanish. Subjects Not on the Chart? None of the conjugations follow any of the rules. Lovely, isn't it? Different tenses have different rules for conjugating. Some tenses only have one or two sets of verb endings. Other tenses require you to add endings to the infinitive, not the stem. Still others require you to create an entirely different stem, but the same basic principal of subject verb agreement holds true. You will always find the subject you need from the subject pronouns chart, then find the ending you need in the corresponding box on the verb endings chart. For more information on conjugating in the present tense, read The Present Tense (Part 1). 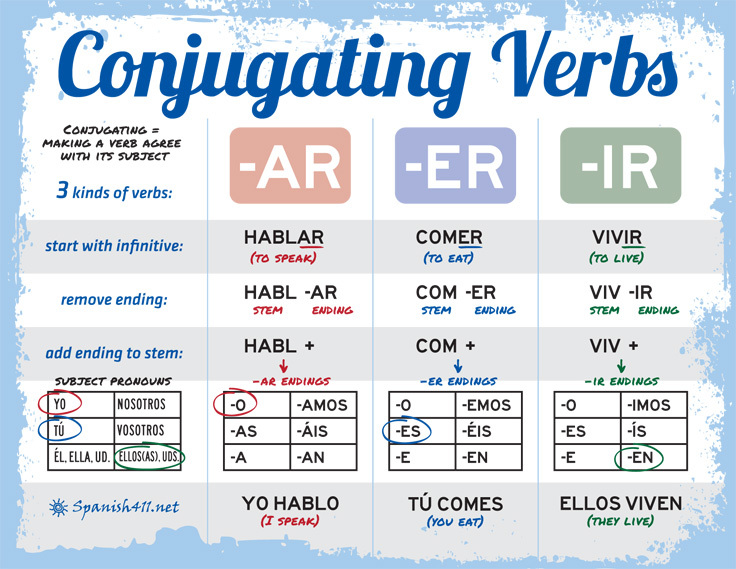 To see samples of verb conjugations in every tense, check out the Spanish Verb Conjugator. To practice conjugating verbs, try out ¡Practiquemos! Verb Conjugation Exercises.